The Gore Vidal Papers are well known for holding the drafts of the author’s novels, essays, theatrical plays, teleplays and screenplays, as well as personal letters from correspondents ranging from John F. Kennedy to Tennessee Williams. Vidal had no shortage of fans, and his fan mail alone occupies many linear feet. 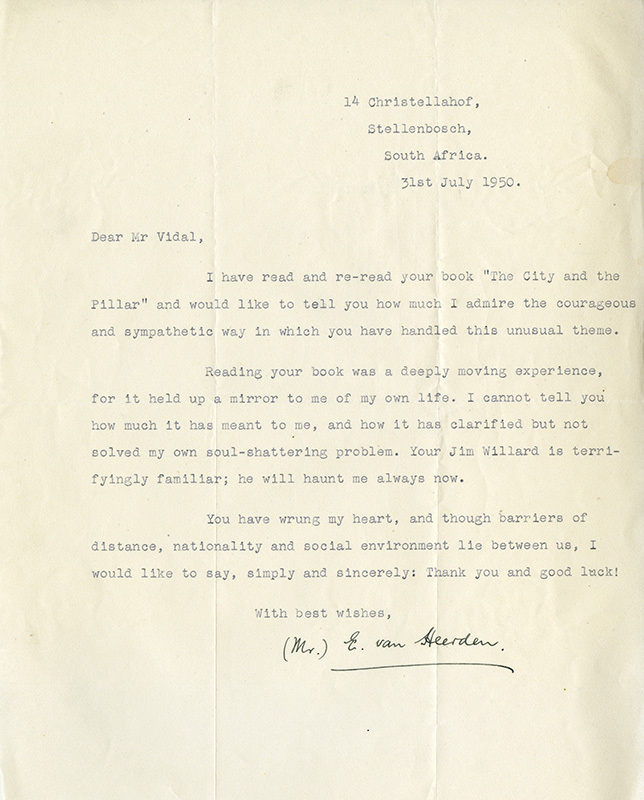 On display is one reader’s especially poignant expression of thanks sent after the publication of Vidal’s groundbreaking first novel, The City and the Pillar – similar letters poured in from “heart wrung” readers worldwide who finally felt that they were not the only ones who were attracted to people of their own gender. Cataloging the Vidal Papers has been the highlight of my twenty-year career as an archivist.